You have a pretty good idea that you have reached the Lamb household in Crumlin, just outside Belfast, when you see a lady in a bright pink Cycling Ulster jacket in the front garden. On this particular Friday morning, the Giro d'Italia Big Start in Belfast is only a week away but Marian Lamb's more pressing concern is helping with final arrangements for the Tour of Ulster which featured top amateur riders from Ireland and Britain last weekend. Tommy and Marian Lamb, or maybe more accurately Marian and Tommy, are a cycling husband-and-wife team. A native of Ballymurphy in West Belfast, Tommy joined the Phoenix Cycling Club in the city as a 13-year-old in 1968. BBC Sport NI's Thomas Kane samples a small section of the route professional cyclists will take in the Giro d'Italia route. His love for the sport has never dimmed in the succeeding 46 years during an amateur career which continues to this day. 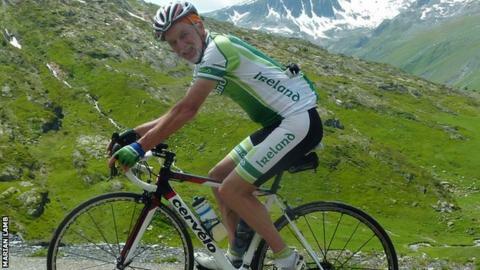 "I've raced at a very low level and I continue to race at masters level," says the 59-year-old, who is the chairman of local bike governing body Cycling Ulster. "One of the beauties of the sport is that you can be competitive at all ages." Tommy and Marian were married in August 1977 and after following her husband around the highways and byways of Ireland and indeed Europe, the lady of the house became secretary of Cycling Ulster in 2003. "She does all the hard work and tells me when all the races are on and makes sure I get to them," smiles Tommy. But Tommy isn't going to need any reminding about the "massive" cycling event on in Ireland, north and south, as the Emerald Isle appears to have turned pink for this weekend's opening three days of Giro d'Italia action. Over each of the last 25 summers, Tommy has attended mountain stages in the Tour de France and he admits he is still struggling to comprehend that one of cycling's three Grand Tours will be in his native city this weekend. "At the Tour, you need to be there on the mountain a day or two before the stage takes place so I've slept in the back of a car, in tents, or in the open air just waiting for the riders," adds Tommy. The West Belfast man admits that Mont Ventoux, where one of his cycling heroes Tom Simpson died during the 1967 Tour de France, is a location with a particular resonance. "I can remember his death when I was a child and it was somewhere that I really wanted to go to. "I have cycled there five times and it's a mystical place. Every time I go there it's like a pilgrimage when you cycle up to the Tom Simpson monument. "Overall, the atmosphere on the mountain stages is incredible and the idea that these world-class riders are going to be in Belfast and the Glens of Antrim and these other places in Ireland is just fantastic." In terms of the Giro's legacy for Irish cycling, Tommy is certain that this week's event will further boost a sport that is already on the up and up throughout the island. "Ten years ago, we had something like 30 clubs in the nine counties of Ulster. "We now have about 130 clubs and our membership has quadrupled in the past few years. "That's not to mention cyclists who are not members of clubs. It's evidenced when you are driving along the roads that cycling is on the rise." Marian believes that looking at cycling as a sport "is probably the wrong way to describe it". "It's just people out on bikes aware of the health benefits - fighting obesity, fighting depression, commuting to work," adds the Cycling Ulster secretary. "We have a fantastic off road scene as well. "The forests in Ireland are among the best in Europe for cycling and with all the new development work around Castlewellan and Rostrevor, we now have the most wonderful trails and that is the kind place to start the children." But as regards making the Northern Ireland road network more cycle friendly, Marian agrees "there is a long way to go". "There are more and more kids wanting to get involved but parents are still a bit wary about taking them on to the roads. "You look at the likes of Holland where by law new roads cannot be build unless there is a complementary cycle path. "Here in the north, we need something like the Westport Greenway in county Mayo. Also in the west of Ireland, a cycling path from Galway down to Cliftden is being built which follows the route of the old railway tracks. "There are some fantastic routes which would follow old railway tracks here and in the background now, there is some discussion about utilising those. "You can imagine cycling from Coleraine to Portrush and Portstewart taking in the coast, with no traffic, it would be fantastic. Between that and getting a velodrome," adds Marian with a sigh. Newtownards man Martyn Irvine won a World Championship track gold in Belarus last year even though there isn't a velodrome on the entire island of Ireland. "There are [other] potential world champions out there being missed because of the lack of facilities," she insists. But while the issue of Giro legacy is rightly part of the debate, the Lambs are determined to focus on the racing this weekend. "This is one weekend where we're going to do our own thing and go away and watch it," adds Tommy. "We haven't decided exactly where we will watch it on the longest Saturday stage. Maybe up in Cushendall or somewhere near Ballycastle. "On the Sunday stage maybe near Keady where they will be a slight hill. "There will be a few hills up around the Glens but for these boys, they won't be mountain stages at all. "They are sprinter stages. The hills that they are going over on Saturday will just be a bump in the road to the riders in the Giro."